Value isn’t something that gets generated, it’s uncovered. It’s attached to the problems it solves or the results it produces. You can’t build it. The way to uncover value is by asking questions. There’s no need to tell me about your solar powered, remote controlled, eco-friendly snow blower if I live in a high-rise apartment. Circumstances are constantly changing, and as they change, relative value changes too. A problem that isn’t worth anything to me today may be worth a king’s ransom a year from now. Keep in touch. One more thought to ponder next week. Outcomes are more valuable than outputs. Emphasize the outcomes you’re working toward. I signed off on the final final draft of my book this morning. It is now, officially, the book I have read the most. Well, the big, adult book I have read the most. (Sesame Street’s “Shake a Leg” wins for sheer quantity.) Completion of this task has me thinking about the big question behind it, like, why is this book important? It has me thinking about my manifesto. The FIT manifesto. A manifesto is supposed to be “a written statement declaring publicly the intentions, motives, or views of its issuer” and here is mine. Few things in life are as challenging to me as remembering which brand of toilet paper I’m supposed to buy. Laura agrees with me on this. Is it Charmin? Quilted Northern? Cottonelle? Angel Soft? Do we pick the Mega-Roll? The Mega-Plus? I feel like I’m rolling the dice every time and about 40% of the time the family ends up with the wrong 18 or 24 pack of paper. I used to think what annoyed me was the size of the roll. Some rolls require less changing than others. As of this morning, I’m changing that because I have pinpointed the annoying thing about choosing the wrong roll. Estimating what’s left on the roll. 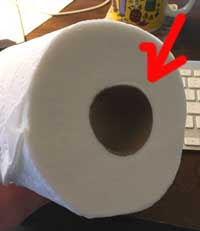 Over the years I have picked up a sixth sense where I can glance at the toilet paper roll and decide if I need to get a backup roll or if I’m going to have enough. It happens almost automatically. Barely a trace of a thought. These little rolls I picked up throw off my estimates. They leave me stranded. They lead to bad decisions and at 5:30am, they make me grouchy.